A trip to your local farmers’ market should be enough to convince you that summer is almost here. Baskets are overflowing with colorful vegetables and salad greens. One of the first spring vegetables to come to market is the snow pea. Bright green snow peas – often used in Asian stir-fries – are not to be confused with snap peas. Both are part of the legume family of sugar peas and have edible pods. Snow peas are flat with tiny seeds that are barely visible through the pods. Sugar snap pods are plump, with visible peas. Low in calories and high in Vitamins A and C, snow peas are a great addition to a healthy diet. How do I Choose Snow Peas? Look for snow peas up to three inches long that are light green in color with smooth, firm skin. Stay away from peas that are overgrown, cracked, wilted or have small spots of rot. As with any tender garden vegetable, they are best consumed within two days. For longer storage, they can be washed, drained and refrigerated in a perforated bag away from strong odors for up to 1 week. How do I Prepare Snow Peas? Very versatile and one of the easiest vegetables to prepare, snow peas can be enjoyed au natural, added to salads, served raw with any kind of dip, or sautéed and buttered. Before cooking or eating them, there are two things to do: rinse them in water, then grab or cut the tip of each snow pea and pull out the tough string that runs along its side. Snow peas sautéed in sesame oil with minced garlic and a ripe red pepper makes an easy vegetable side dish. Sprinkle a tablespoon of toasted sesame seeds on top and serve! In this simple snow pea dish, substitute mint for the red pepper and add pine nuts! Using just a few ingredients, The Minimalist, Mark Bittman shows us the easiest way of all to prepare snow peas. Similar to green bean salad, Swedish Vegetables are marinated in a simple brine. This quick recipe takes just 5 minutes to toss a few bags of frozen vegetables together. Forget it in the fridge for 24 hours, pull it out and serve. You can’t get much easier than this! A “knife and fork” salad with a creamy-style dressing, Butterhead Lettuce with Spring Radishes and Peas with White Balsamic Vinegar Dressing is cool and refreshing for a hot summers night. As an appetizer, snow peas make the perfect dipper. They don’t require any chopping and they’re a fun alternative to celery! This list of nine Hot and Cold Dips will give you plenty of ideas for summer entertaining. 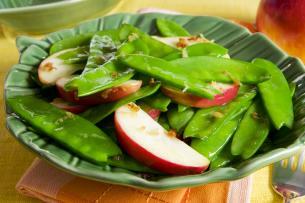 Served as part of a Vegetable and Dip Platter, snow peas will help get your party underway! Offer more substantial spreads like Heart Healthy Shrimp Dip and Sun Dried Tomato Hummus with Snow Peas on pita wedges or toasted baguette slices. Spaghetti with a Twist is made with cold spaghetti, udon or Chinese rice noodles. Bright green snow peas and bold red bell peppers tossed in a peanut sauce made with peanut butter, gets its kick from red pepper flakes and garlic. Super easy to prepare and beautiful too! Cristin Dillon from Eat Like Me, makes Spicy Chicken and Snow Peas look as delicious as it is healthy! If hot and spicy has you running for a glass of water, cut back on the chili paste and garlic. Lots of color with fresh veggies and of course, snow peas! Here, Kathy shows us how to make Fried Rice. She uses frozen peas in this recipe, but you could easily substitute frozen snap or snow peas for authentic Asian Fried Rice. If you’re looking for an elegant hot dish that’s quick and easy to prepare, Asian Beef with Snow Peas can be whipped up in 15 minutes! Served with a side of brown rice or egg noodles, this garlicky-ginger steak dinner will soon become a weekly favorite! Vegetarians will love this protein-packed tofu dish. Crisp snow peas and succulent mushrooms swim alongside crispy sautéed tofu in a very easy and flavorful sauce. Healthy eating made simple! Buy local. Buy fresh. Find a farmers’ market and look for the bright green snow peas! I’ve always loved snow peas, but was hesitant to cook with them. This gave me a lot of great ideas and I’m now headed to the farmer’s market. Thanks! Thanks for the tips on the snow peas. The first one, the side dish, sounds good, think I will try it! Great article Donna! I made the Snow Peas with Garlic, Pine Nuts and mint. This dish was a sure winner with my family. I am sure I will make it again! Ooohhh….more good ideas! I was thinking of stuffing them with herbed cream cheese sometime. That would be a great summer treat. Thank you all for the wonderful comments and tips everybody! Happy Cooking! There are very few web sites out there that are specifically designed for the beginner cook. i appreciate you being here to answer our questions about preps’of foods . a great help for sure. Nice tips. happy cooking to all. Hi Kathy. Great tips and hints for beginners. I too have the same heart as you; wanting to teach people how to cook. It’s such a great feeling.